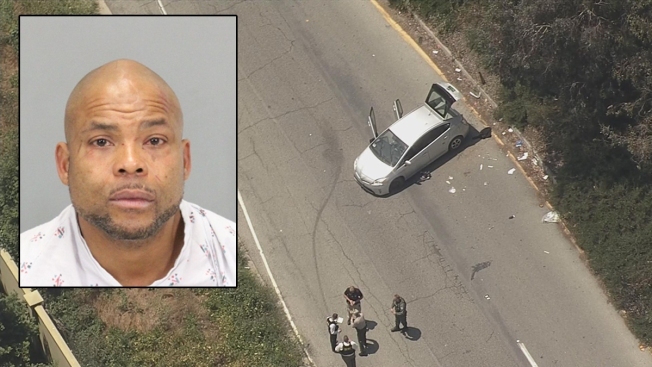 A day after two people were killed in the South Bay off Highway 17, the Santa Clara County Sheriff's Office announced on Thursday the arrest of a 43-year-old man who took off in a Prius on charges of murder, burglary, kidnapping and false imprisonment. Sgt. James Jensen said Andre Redmon of San Francisco was booked following the Wednesday saga where first, a man inside a Redwood Estates home near Los Gatos was shot to death, and then Redmon's passenger died following a crash in Redmon's getaway Prius in Campbell about 12 miles away. Redmon was booked on suspicion of two counts of murder, two counts of false imprisonment, one count of kidnapping for robbery and one count of burglary. He was being held on no bail. Investigators were at the Redwood Estates home Thursday gathering evidence. They offered no motive in the crimes and did not say whether Redmon knew the victims. At first, Redmon said he would grant an interview to NBC Bay Area. He later declined that request, but not before blurting out: "If I'm going to tell my side, I'm going to tell my attorney. I don't have one yet." The case was being reviewed by the Santa Clara County District Attorney on Thursday afternoon. Jensen said Redmon originally dumped his getaway Prius and ran away from the crash on Highway 17 near East Hamilton Avenue in Campbell. He was arrested Wednesday night. Deputies are linking Redmon to the two deaths, with the first reported just before 11 a.m. That's when deputies responded to a report of shots fired in the 21400 block of Madrone Drive in Redwood Estates near Los Gatos. When they went inside, they found a man shot to death. Jensen said he didn't know if anything was stolen inside the house, but he added that burglary charges can stem from intent to steal. Two other unidentified people were injured in Redwood Estates, deputies said, adding that one person was taken to the Santa Clara Valley Medical Center and the second was treated at the scene. More information on them wasn't available. It's unclear how the two people are associated to the man who was shot to death. Neighbor Phil Dutillo told NBC Bay Area he believed a father lived there with his two sons and possibly a girlfriend. Another neighbor, Alice Hoagland, the mother of Mark Bingham who died in the Sept. 11 terrorist attacks, said her walk was interrupted with a swarm of deputy cars. She lives about half a block away. Crime scene tape still marked the home on Thursday. Witnesses then called for help describing a silver Toyota Prius seen leaving the Los Gatos scene. Deputies on motorcycles spotted the hybrid on Highway 17 near Lark Avenue, sparking a chase. At one point, the Prius crashed into a wall at the Hamilton Avenue exit. A passenger, who was found injured in the Prius, was taken to a local hospital, where he was pronounced dead, according to deputies. It's undetermined how the passenger died and what his connection to Redmon is. The Santa Clara County Medical Examiner's Office on Thursday did not release the identities of the men who were killed. Redmon is expected to appear in court Friday. NBC Bay Area's Damian Trujillo, Robert Handa and Rhea Mahbubani contributed to this report.